The July 7th bombings of 2005 rattled London, how could you reassure passengers that stepping back aboard buses and tubes would be okay? A simple, stark poster for the London Bombings Relief Fund, that was displayed all over London in the month afterwards achieved what no photograph could ever do. It included a quote from the speech Mayor Ken Livingstone made after the bombings beneath a bold typeface simply saying, 'London Stands United'. I was heading home from the London 2012 Olympic Games celebration concert that had been taking place in Trafalgar Square across the street. Seeing the poster, I took three pictures of just the poster, but how about getting the poster in context with a train rushing past? But I was without a tripod, improvising in the dim light, I placed the camera on the platform and held the shutter open as a Bakerloo train headed Westbound, without a clue as to the zoom, exact composition or much else! The train gathered speed and sped past, the shutter sluggishly closed. And the picture I got is the one you see, one picture and done. Even getting in the watchful eye of the CCTV camera in the right above the platform. 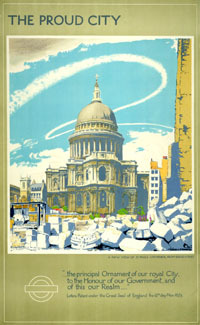 The poster reminded me of all the wartime produced pieces to keep the nation (and the capital) going as things got bad. In 'The Proud City' series, St Paul's is shown defiantly surrounded by rubble and a blue sky, an icon of London still there, not to be shaken. In the same way, having the transport system running on the day after the attacks showed everyone that the transport icons of London, it's red buses and tubes, were as dependable as always. The photograph in this post can be seen, along with several others, on display in the ticket office of Swindon Railway Station.